Mike Mann's "secret" meeting on the Medieval Warm Period | Watts Up With That? A usual reader of the blog sent me yesterday an interesting news from a Portuguese newspaper. It deals with the classic Medieval Warm Period problem, in the most green Portuguese newspaper. I immediately recognized one of the worst environmental journalists in Portugal, dealing with one of my favorite issues. Interestingly enough, Ricardo Trigo, a portuguese climatologist, was trying to explain the pseudo-science behind climate change and global warming, confusing things like Greenland’s vikings and Maunder’s Minimum. But what really interested me in the story was a reference to Phil Jones, the person in the center of the ClimateGate controversy. And references to a conference in Portugal, regarding the Medieval Warm Period. I spent some time trying to figure out what had happened. Turned out that I had not read the news with attention: the conference had happened a month before! All the information I’ve got till now makes me believe that this was an almost secret meeting. No news transpired, not even here in Portugal. Given the abstracts, and the one seen above, their intentions are clear! If Ricardo Trigo kept his mouth shut, nobody would probably hear about it. So I wish to thank my loyal reader for bringing this to our attention. Here’s more on this conference. First have a look at the attendees. 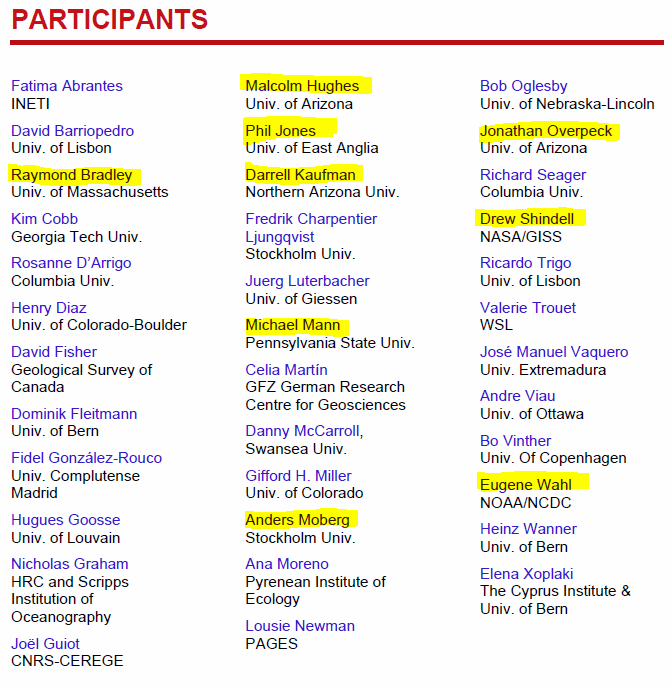 It reads like a who’s who book of paleoclimatology. I’ve highlighted some of the more recognizable names. The source of that list is the brochure, which you can download here. With all these paleo-bigwigs meeting in one place, surely somebody would have written about it? Clearly, they seem to be embracing the existence of the MWP, but at the same time once again they appear to be trying to figure out how to minimize it. And look at the attendee list and lack of press coverage, you realize it’s the same gang of people running the same game all over again. The key is, will they learn to shoot straight this time? October 22, 2010 in Paleoclimatology. Apparently, the Vikings main mode of transportation, the knarr, was like the modern day SUV and thus caused man made warming even back then. Well, you can run, but you can not hide…..
Don’t they just have to revamp that old nature trick (you know the one that is not a trick at all but rather a clever thing to do) that they employed in ‘hide the decline’ ? I think that we can all guess as to what will remain of the MWP once proper homogenisation and other statistical tools have been used to massage whoops I mean to present the data in a meaningful manner easily understood by policy makers. Well if you can’t ignore it, at least try to minimize it as much as possible (As much as they can get away with without prosecution). Clearly they have learned nothing about ethics or how to conceal their intentions. There will be no straight shooting here. They’ve already shown the nefarious depths to which they will stoop and the pressure to keep this charade going has to be immense. Expect even more ridiculous conclusions to be published in the fifth assessment. They will not go quietly into the night. Nothing like a fresh set of marching orders to get everyone back on the same page. Well you beat me to it. It had just been posted at Tom Nelson and made my jaw drop. I posted here at once on Tips and Notes but that did not clear for a few minutes, Spam dragon problems I imagine, by which time you had it up on the front page. Fascinating isn’t it? It raises so many issues it will take time to digest but as far the attendees are concerned the outcome cannot be good. After all there is plenty of time to take the implications apart. And publicise them. It is what the blogosphere does so well. Cats out of bags really. Hope all is continuing to go well with the recent medical problem. “Reconciling multiple proxy climate records—what do the differences indicate regarding the scale of MCA/MWP climate?” Without any instrumental records of the ‘Medieval Climate Anomoly’ or the ‘Medieval Warm Period’, what method(s) could they possibly use to reconcile what they think their proxy records show? Note, also, that there is no mention of any possible error in those proxies. “What do the latest modeling results tell us about possible forcing mechanisms during this period?” Since the models haven’t been shown to have any use in “predicting” existing weather/climate conditions without being “fudged” to produce them and – most especially in my mind – since output from computer models is not data nor any other sort of objective record, those results cannot possibly tell anything about anything in that period. “What are some other impacts of climatic variability during the MCA/MWP regarding such topics as changes in ocean basin tropical cyclone activity?” Again, the utter absence of anything better than second- or third-hand proxies for measurements of “climatic variability” let alone tropical cyclone activity defeats any attempt to ascertain “other impacts”. Do you suppose the insurance companies have records of loss going back that far? “What were some of the key regional patterns of climatic anomalies during this time?” and “How do they compare with 20th century patterns?” Once again, what are the sources, if any, of their data on regional patterns of climate, let alone anomalies? What is the “base year” or decade or century against which they are relating this missing data to? Unanswerable, to my understanding. Much ado about nothing, redux; or so it seems to me. Sorry to Godwinize this discussion, but it reminds me of Iran’s Holocaust Denial conference a few years ago. Methinks they’re afraid of being made irrelevant, and thus wanna keep that research money train rolling. Make no mistake, AGW is a big time industry and the investors are not going to give up their investment easy, if ever. I wonder if they’re looking at the budget cuts in Europe & the upcoming US elections & formulating plans to keep taxpayers still on the hook for their speudo research and planet saving meetings in exotic, beachfront, tropical locations. I don’t read many scientific papers, but it’s interesting that Hughes’ intro is written in the style of post-modern poli-sci deconstruction. There once was a big difference between the language of the hard and soft sciences; maybe not so much any more. The key phrase being “divert attention”. Do they not yet realize, every word they utter is examined under a microscope. As it should be, considering the implications. First Real Climate and the other CAGWers claim that paleo reconstructions aren’t terribly relevant to the science of climate. Then the Hockey Team opens summer training camp in secret in Portugal to try to bury the MWP – again. All while Gavin Schmidt et al. publish a paper attempting to minimize the importance of water vapor in driving climate. Somebody should tell Tom Fuller that the other side of the debate doesn’t think it’s over yet either. The warmist leviathan is like Michael Meyers in the Halloween movies. It isn’t enough to knock him down or shoot him. Once he’s down, you have to cut his head off to make sure he’s dead. I think this is damning evidence against Mann in the Scamgrant Virginia case, that Cuccinello[sp?] can use to show intent to defraud, since Mann was one of the key cover-up agents at this conference. Can someone make sure this evidence gets to the VA DA? Intent is a key ingredient in government fraud cases. Make that Loser. Or Moron. Boy, scientists doing science (and without alerting the media! )…That does seem nefarious! Ok, got my bag of grain & ready to sail . When is the global warming predicted to leave Greenland bare of cold and the fertile land that was available for the Vikings due to unfold again? LANK What a comment we were thinking a like. Dr “Mad” Mann will hang around our necks as long as we keep electing and or supporting his benefactors. November 2 should be a harbinger of some sanity to come, but don’t expect this manndness to end any time soon. Watch for the “Biodiversity” bandwagon to roll triumphantly into town any day now, driven by the very same people that brought us acid rain/ozone holes/global warming/climate change/climate disruption/population explosion etc, etc ad nauseated! Maybe this was a remedial statistics tutorial, under the cover of a flock of paleoclimatology papers. They have to learn how to lie more convincingly before AR5. What was the original IPCC chart showing the MWP at the same temp level as today based on? WASG? Nothing more would need to be seen to understand the intent and import of their deliberations. Science be damned and full speed ahead on the steering of the committees. I can’t remember where I saw it but back around the Climategate time someone published a diagram that had all the principal actors listed and their connections to each other. I wonder how many of these Lisbon attendees were on that diagram? Seems like this should be pinned to the top of the front page for a few days so everyone sees it. Also, so “they” know we know. The threat of the MWP at present is not to the IPCC or the models– its a 4D ruling challenge in the courts ( Must polar bears be listed as endangered? And can the endangered species act can be used to set climate policy.) A warmer 10-11th century is powerful evidence the bears survival is not endangered at higher temps. The question is- how much higher? Strategically it may be more important to limit the damage and admit the MWP was as warm as current – allowing them to argue the higher anticipated temps are still a threat. While it is important to focus on science understand the “environmental” NGOs have been focusing on strategy. The circus that is the IPCC main function now may be to deflect attention from the main thrust in the courts using the “pit bull of environmental regualation” the Endangered Species Act. It has already been ceded by the NGOs attainment of the CO2 regs by direct confrontation is no longer possible– they will now come at this sideways– watch for it. The science and attention has been framed to look at the proxies of the late Holocene. They have framed the debate and we took the bait. We are focused on but one front in the assault on CO2–they have opened a second and perhaps more powerful one with legal teeth. The real question we need to focus on is how much warmer was it in the early Holocene (not the MWP) and the question of polar bears. And if they lose on the bears they will turn to increasing aridity endangering some western plant, or increasing acidification endangering some near shore mussel, if they lose on that they will find some other claim in the models that will impact some other creature. The NGOs have vast amounts of cash and a universe of attorneys. We better start talking about this soon–and I would advise all to brush up on the ESA and the current legal interpretations. If you thought the Hockey Stick was bizarre wait til you see the “science” behind a sub-population or an evolutionary significant unit . Its about to get far more complex. 3) Discuss the temerity of people outside their field interested in reproducing one of the more ‘seminal’ papers (if there is such a thing in this field). Tricks, rewriting history, it’s all just more shop talk from ClimateGate scientists, nothing to see here. Move along folks. 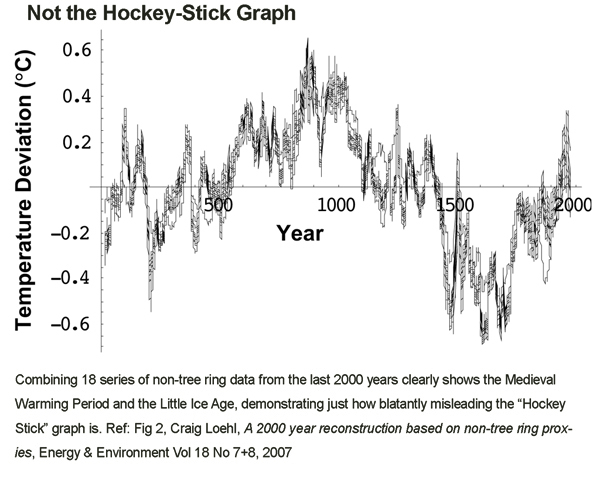 Ross McKitrick, an overview of the Hockey Stick graph that wipes out the Medieval Warm Period. They want to abandon both the Medieval Warm Period and Medieval Climate Anomaly as concepts. Step 1.) Re-label as concepts those historic and recorded events. Step 2.) Rationalize them as unimportant to fend off growing concerns that the climate is progressing along a natural path to the Next Ice Age over the course of 8-10,000 years. By interrupting the curve (yes, the Ice Core temps from Vostok form a dome-like curve) more attention can be focused on the carrot (post LIA) anomaly. Step 3.) Redraw the curve of the last 10,000 years to show an unnatural spike. Step 4.) Integrate this with cherry-picked example to demonstrate Climate Warming/Change/Disruption. Step 5.) Release new theory as AR5. Minimalize, relabel, dismiss, rewrite, package and distribute. Busy Beavers chewing away in the night. I was very disappointed by the lack of Australian globetrotting Warmist at this exclusive conference, till I realized the 2 cosy little hotels in Lisbon were neither big or grand enough for our globetrotting climate conference rat pack junkies to bother attending. Shame on them now the world is defiantly doomed! The Australian Department of Climate Change flew 93 VIP staff members first class to 64 global climate change meetings in just 12 months at a cost of $4.34 million. The swarm of bureaucrats attended more than one international climate conference every week, in a bid to save the world from Co2 induced Climate disruption. However the appropriate CO2 carbon credit indulgences were purchased to neutralize the excessive/compulsive nature of the down under climate phobic’s. So no actual CO2 was discharge into the atmosphere. Unfortunately copious amounts of unaccounted CO2 were discharged at the conference gabfests, pushing the earth closer to the final climate disruption cataclysm. THE fight against global warming has globe-trotting bureaucrats attending more than one international climate conference every week. Joel, this is a political statement, not a scientific statement. Science is not preplanned. I think we are seeing a continuing idealogical drift which has been proceeding for some months now – to both defend the hockey stick by various means [some being rather “low”] as well as to sideline it with the idea that a MWP is irrelevant. While not having seen the detail behind this summary, it does suggest once again the clear conviction that Gavin once put in print – that whether or not there was a MWP is irrelevant to him – he is being driven almost entirely by the physics, and historical reconstructions only serve the purpose of emphasising the extremes of sea level and climate that we could generate – this time in a much shorter timeframe. Historical reconstructions do not provide an understanding of what causes the climate to change, just how damaging such changes could be. Putting that in my own words – they have little or no idea what may have caused a MWP (if it happened), but it is not relevant because they are rock solidly convinced by the physics that the rise in CO2 right now will cause a catastrophic shift in the climate. This is what is suggested to me by the phrase “physical climatology”. This serves again to point back to the role of models in the debate. It is not only true of historical reconstructions like the MWP – but it is equally true of todays “missing heat” – that the fact that the planet has not warmed in accord with model predictions is irrelevant. There may be all sorts of natural phenomenon suppressing the rise that should be there – but the clear conviction is that the models are describing the base level physics – which can only be suppressed by natural fluctuations for so long. But once the unknown natural causes reach their limits, the underlying physics as represented by the models will come in like a big wave and we will all be ruined. This is where there are fundamental disconnects between the debating groups. The sceptics are looking at the data and saying “we don’t know”, while the AGW establishment is looking at the models and saying “who cares what the real world measurements are [“they are a distraction”]- we know we are going to destroy the planet”. Also, getting rid of the medival warm period…what’s next they’re going to deny that the Romans were in a much warmer time period as well? Has anyone calculated the carbon travelprint of all the participants? Somebody should tell them about low-carbon teleconferencing…which is technology that is now just about mature enough to be practical. How curious. A belief in the Medieval Warming amounts to picking over definitions not merely of epochs which may not have existed in any cohesive way, but of the extent of the epoch which may not have existed. And what’s the diff between an epoch and the extent of the epoch? Those shovelling the aimless verbiage don’t care, they’re just shovelling; and those reading will be too fatigued to dispute. That’s how academic language works. By fatigue. Sound precise, be vague, and go loooong. The reason for this major thought-shift? Recent publications by themselves, the flatteringly self-titled high-resolution set. Since the high-res folk have moved away from such trash as descriptive climatology, I suggest our own epoch must be equally putative, particularly since it’s part of the Late Holocene, and we must forbid all reference to recent and future geographical and temporal extensions. We don’t want our hig-res people going all low-res. Modelling our own “putative epoch” will, of course, be out of the question. Suits me. What you summed up could be the case. Especially this bunch of scientists/activists who are ever so shy of media coverage? And geez they could have chosen Greenland instead of Lisbon Portugal in september since the world warming… no? For someone who, as I recall, claims a Phd in physics from Cornell, you seem quite oblivious to the difference between science and this meeting. This meeting had little to do with science, perhaps nothing at all. It was, as they said, about distracting attention from one matter in order to focus on another and place it in a different context. The only other profession that I know of that adheres to this methodology is the practice of magic. I note that magicians also include the use of “tricks” in their performance, and their skill set includes the ability to “hide” all manner of things. When questioned in regard to their methods, they are as secretive as climate scientists, and notorious for attempting to make their work impossible to replicate by others. None of them to my knowledge however, seriously expect one to believe that anything actually disappears because they waved their wand amidst a puff of smoke and somehow altered reality. In this they differentiate themselves from climate science. They do not have the egos or daring to claim they are capable of advancing magic to the point that it is indistinguishable from science. I am, on the other hand, prepared to pay money to watch the talented amongst them perform. This is in contrast to the band of climate magi whose performance is designed to make me pay, be they talented or not. Military intelligence. Chocolate substitute. Rap music. Jumbo shrimp. Downtown Podunk. And high-resolution paleoclimatology. The according to the definition of conspiracy in Wikipedia, this would be a cabal. How will they back cast their models now? I’ll swear that thing gets fuzzier and fuzzier (maybe time for a sight test). Climate Change is not your enemy. It is totally natural. It is illogical to fight it. Climate Change is good. It is your friend. It pushes the human race forward. What would be more interesting than looking at who was there would be finding out who was not invited. Mike M. asked “where is Keith Briffa”? Yes, and why? A couple of others occur to me, I can’t remember their names, but I would have recognized them if they were there. Steve McIntyre should be able to analyze this. Everyone involved keeps trying to tell us that it is the physics that is important and the science is rock solid as regards the heating effects of increased CO2. Bearing in mind how much time, effort, and money, is spent in trying to continually refute or minimise the MWP it is clear that the physics is not as robust as is suggested. Maybe they were just discussing the next winther? “….. in what specific ways does the post-1980 period, considered a time when the global warming signal is evident [? ], different from the largest anomalous multidecadal periods of the MCA/MWP…..? Seriously? This is the best you could do? “[A]n almost secret meeting”, organized by Mike Mann? You’re getting desperate. The symposium was actually announced in June 2010, and they have a website. While not really “secret”, one might describe it that way because unlike the many things Dr. Mann has been doing lately, there wasn’t one peep of press coverage about it. Anyway, the Vikings in Greenland might be one of the more visual aspects of the MWP, a thing that is really telling is the average age of the Europeans during the MWP. At the end of the MWP in 1275 the average life expectancy for Europeans was 35 years, 50 years later during “The great famine” (caused by unusally harsh winters and cold wet summers from ±1310 until ±1330) it had dropped to 29 and another 25 years later it dropped to just over 17 during the height of the “Black Death”. It took Europe as a whole around a 150 years for its population to recover to levels as seen at the end of the MWP. Even today there a regions in France that are less populated than they where at the end of the MWP. I wonder if they can write this out of the history books. Hasn’t anyone told this gang that the end buzzer sounded already? The game is over. It’s like they’re all standing around, alone on the field, demanding a rematch. We shouldn’t begrudge the boys a holiday in Portugal, after all if you stay inside playing with your models all the time you become pasty faced and lose all touch with reality. You might even start believing the world is coming to an end. Nothing like a bit of winter sun to melt away the paranoia! What is interesting is that in the middle of the MWP Europe exeperienced the ‘Great Famine of 1315–1317 (occasionally dated 1315-1322) resulting from a series of severe weather events. It shows what extremes nature can enforce upon us even though in this case, we still have a warm period. As I write this in Bristol UK, we are already experiencing some unwelcome cold weather. I just hope that we are not on the way to one of these extreme events, and that the sunspots get their act together. [Wikepedia] was the first of a series of large scale crises that struck North Europe early in the fourteenth century, causing millions of deaths over an extended number of years and marking a clear end to an earlier period of growth and prosperity during the eleventh to thirteenth centuries. Starting with bad weather in spring 1315, universal crop failures lasted through 1316 until summer 1317; Europe did not fully recover until 1322. Gosh, Portugal is a nice place. I always hoped to go there on business, but finally had to take vacation and pay out of pocket. No doubt, the team is a smart group. Out of my league. A number of scientits were saying that Michael Mann should release the code and dat for reproducibility. Or even as just a good idea!!!! Phil Jones wrote a long email to the scientists, saying why not to relese code.. This is for YOURS EYES ONLY. Delete after reading – please ! I’m trying to redress the balance. One reply from Pfister said you should make all available !! Pot calling thekettle black – Christian doesn’t make his methods available. I replied to the wrong Christian message so you don’t get to see what he said. Told Steve separately and to get more advice from a few others as well as Kluwer and legal. Mann el al material (to be) posted on the website is sufficient to ensure reproducibility, then there is no compelling need to force them to hand it out. If not,then the source code is warranted. Also, even if there is no compelling need to make the source code public, doing it anyway would clearly be beneficial for the entire debate. It was a heads up, because various other scientists (possibly Professor Arnell as well) had been saying that Mann should release his code, following MM’s paper (debunking Mann’s hockey stick) – (iethat MANN should release the ALL the cose and data for the papers that LOST the MWP. Phil Jones sent a long email saying that this should not happen. I’ve been away this week until today. Although the responses so far all make valid points, I will add my thoughts. I should say I have been more involved in all the exchanges between Mike and MM so I’m probably biased in Mike’s favour. I will try and be impartial, though, but I did write a paper with Mike (which came out in GRL in Aug 2003) and we currently have a long paper tentatively accepted by Reviews of Geophysics. With the latter all 4 reviewers think the paper is fine, but the sections referring to MM and papers by Soon and Baliunas are not and our language is strong. 1. The papers that MM refer came out in Nature in 1998 and to a lesser extent in GRL in1999. These reviewers did not request the data (all the proxy series) and the code. So, acceding to the request for this to do the review is setting a VERY dangerous precedent. Mike has made all the data series and this is all anyone should need. Making model code available is something else. 2. The code is basically irrelevant in this whole issue. In the GRL paper (in 2003 Mann and Jones), we simply average all the series we use together. The result is pretty much the same as MBH in 1998, Nature and MBH in 1999 in GRL. 3. As many of you know I calculate gridded and global/hemispheric temperature time series each month. Groups at NCDC and NASA/GISS do this as well. We don’t exchange codes – we do occasionally though for the data. The code here is trivial as it is in the paleo work. MBH get spatial patterns but the bottom line (the 1000 year series of global temps) is almost the same if you simply average. The patterns give more, though, when it comes to trying to understand what has caused the changes – eg by comparison with models. 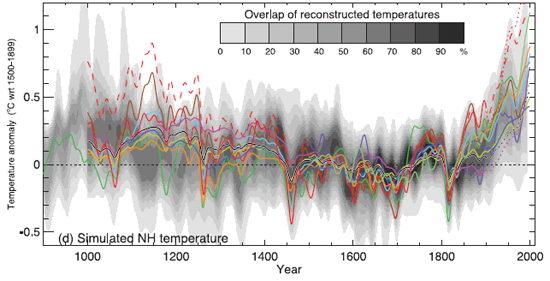 MM are only interested in the NH/Global 1000-year time series – in fact only in the MBH work from 1400. 4. What has always intrigued me in this whole debate, is why the skeptics (for want of a better term always pick on Mike. There are several other series that I’ve produced, Keith Briffa has and Tom Crowley. Jan Esper’s work has produced a slightly different series but we don’t get bombarded by MM. Mike’s paper wasn’t the first. It was in Nature and is well-used by IPCC. I suspect the skeptics wish to concentrate their effort onto oneperson as they did with Ben Santer after the second IPCC report. 5. Mike may respond too strongly to MM, but don’t we all decide not to work with or co-operate with people we do not get on with or do not like their views. Mike will say that MM are disingenuous, but I’m not sure how many of you realise how vicious the attack on him has been. I will give you an example. When MM came out, we had several press calls (I don’t normally get press calls about my papers unless I really work at it – I very rarely do). This was about a paper in E&E, which when we eventually got it several days later was appalling. I found out later that the authors were in contact with the reviewers up to a week before the article appeared. So there is peer review and peer review !! Here the peer review was done by like-minded colleagues. Anyway, I’m straying from the point. Tim Osborn, Keith Briffa and I felt we should put something on our web site about the paper and directs people to Mike’s site [RealClimate-BJW ?] and also to E&E and the MM’s site. MM have hounded us about this for the last four months. In the MM article, they have a diagram which says ‘corrected version’ when comparing with MBH. We have seen people refer to this paper (MM) as an alternative reconstruction – yet when we said this is our paragraph MM claim they are not putting forward a new reconstruction but criticizing MBH 1998 !! We have decided to remove the sentence on our web page just to stop these emails. But if a corrected version isn’t a new or alternative reconstruction I don’t know what is. So, in conclusion, I would side with Mike in this regard. In trying to be scrupulously fair, Steve, you’ve opened up a whole can of worms. If you do decide to put the Mann response into CC then I suspect you will need an editorial. MM will want to respond also. I know you’ve had open and frank exchanges in CC before, but your email clearly shows that you think this is in a different league. MM and E&E didn’t give Mann the chance to respond when they put their paper in, but this is a too simplistic. It needs to be pointed out in an editorial though – I’m not offering by the way. He then forwarded the above email onto Michael Mann…. not to copy Ray and Malcolm and to DELETE after reading. I’ll let everyone interpret it for themselves…..
Two most recent temperature reconstructions by Loehle and Ljungquist indicate existence MWP. This is also confirmed by changes in the Arctic magnetic field which can be used as a rough indicator of the N Hemisphere’s temperature movements; the GMF can be considered as a reliable guide for the Arctic itself, as the period of recorded temperatures demonstrates . The Team are up to their ‘old tricks’. So what I’m getting about this meeting of “the age of stupid” Dr. Evils is to rehabilitate the paleoclimatology, more secret proxies to push the IPCC position on the next Doom (fifth) report and abandonment of both MCA/MWP, AaaaLL this after being caught for hiding the decline/manipulating data/FOI blocking and then losing data sets when caught AND are still under investigation. In their evil Lair they are plotting with super computers, GIS graphs and god like proxies to take over the world by changing climate history! On a KAOS secret location in the middle of the north pacific ocean, inside Mauna Loa volcano all disguised as a Observatory for CO2 in the world! WE have harnessed the energy from the sun, mirrors are in place to block out the light to the earth focusing the suns light through the Hubble telescope to bring 10X the sun power to our cognitive computer brain!!!!! Muahahahaaa!! Soon as the brain comes on line, no need to think, we’ve programmed the brain to think for you and for our future generations!! When the sun is blocked and the power directed to the great CCB you will have no need to exist, CCB models have calculated you are not sustainable for the future. Those not in compliance with the CCB consensus law will come under investigation as a terrorist security risk and then ticketed for immediate compulsory enrolment for re-education. Multiple CCB warnings can be subject to deletion. Where is Austin Powers when you need him? heheheheh! The next UN scare is already pushed down the pipeline. Pachauri’s IPCC will give it a new go but the next scare is coming. 1. Whatever goes upon two legs with the MWP is an enemy. 2. Whatever goes upon four legs, or has wings, without the MWP is a friend. 3. No animal Warmist shall wear clothes because it is so darn hot. 4. No animal Warmist shall sleep in a bed write any more emails about Tricks and Hiding The Decline. 5. No animal Warmist shall drink alcohol read WUWT. 6. No animal Warmist shall kill argue against any other animal Warmist. 7. All animals Warmists are equal except for our high priests Mann and Jones. Send me an email…………………….. . I believe that in “fastest draw” style shooting contests, accuracy is not part of the competition. Its ironic that the word CABAL comes from the hebrew word CABALE which was a medieval mystical tradition. The Hockey Team must have worked out by now that hatching cunning plans by email is a tad risky, what with all the troublesome FOI legislation. What better way to organise such a ploy than over drinks in a hotel bar in Portugal? But don’t you think it’s interesting that it wasn’t splashed all over the place on the basis: “See? All these deniers keep claiming something called the Mediaeval Warm Period, so we’ve looked at their claims, and obviously they’re completely wrong, it probably didn’t happen and even if it did it really wasn’t important, move along, nothing to see here… ” sort of thing? There are thousands of academic conferences and symposia every year that attract no mainstream press coverage – I don’t think there’s anything remarkable about this one. The paleo community is still a small, incestuous and paranoid band, and it is a great pity that they haven’t been practically ignored but rather propelled to iconic status. But since they have been propelled to such prominence they have been subjected to a degree of scrutiny that they could not have foreseen – and we’ve seen the bad behaviour of The Team and their disgraceful incompetence. Whenever Mann appears he will now be considered a laughingstock, except by this community of course, but even this community (as revealed in Climategate emails) consider he is nasty, petulant and a loose cannon. There are surely many other minor areas of science behaving just as badly and incompetently, but their impact on the world is, thankfully, minimal. Not so this group, alas. The meeting is listed on the Joint Office for Science Support website as an example of “the diversity and breadth of JOSS”. The meeting was announced in advance, and through the relevant channels, but it’s hardly likely to be well known outside this tightly-knit cabal. This is just business as usual for the paleo community. They’ve had it in for the MWP for years. And, yes, Michael Mann was joint organizer. Something else he can put on his 29 page Curriculum Vitae (his paper at Lisbon is on page 17) http://www.meteo.psu.edu/~mann/Mann/cv/cv_pdf.pdf. From here we see also that he has been doing the rounds this month promoting his book ‘Dire Predictions’, citing Climategate as a ‘potent example of the politicization of science’ and making sure he gets the message out that he was wholly exonerated of any wrongdoing. Professor Wanner is talking about this meeting in German. There is also an interview about the MWP with Ljungqvist in English. Our side’s lawyers should counter this claim by saying that US restriction on CO2 will have no real effect in light of Chinese & emerging world emissions. In number of previous threads I wrote about NAP (North Atlantic Precursor), showing good correlation with CETs. Data for NAP for period pre 1600 is sparse and incomplete, so having some of the data available I plotted it (NAP 1100-1600) , and indeed indicates that there was a MWP. This supports my favorite candidate for what’s behind this movement: scientism, or the belief that science, and only science, has the answers — and that physics is the queen of the sciences. (The others are just “stamp collecting.” (Rutherford)) The core people in the movement like Weaver, etc. are lost in a world of abstractions that they think is the Real World, where they are kings, and they want to extend their domain. Oops, I should have outdented that last paragraph, not indented it. ROTFLMAO! now you owe me two keyboards and two monitors! The cat is ok this time as he seems to be avoiding the computer that has WUWT on the screen. Surely all the subterfuge in the world by even this lot can’t trump a cooling planet. They said it would get warmer and it got colder instead. Even the lazy MSM will have to take notice of cooler climes. La Nina has made life on the mid north coast of NSW very pleasant indeed. Mid October and no heat waves yet. What a change from the last few years. BoM is trying it’s best to make 2010 the hottest ever but it’s hard going. The CSIRO says the current wet weather won’t last because they will lose a half billion in research money to study geosequestration. CO2 has to be a problem or many of the scientists are out of work. Couldn’t happen to a better bunch of [snip]. Climate [snip] Hides the Medieval Warm Period. These extremists are always on taxpayers dime. Climate extremism equals higher taxpayer payouts and worldwide jollys. After the Emperor’s Cloak has fully unraveled, and CAWGism is Over, that should be the Larger Lesson of the affair. Following the conference, a Team spokesperson declared the MWP and LIA were simply epicyclic events. The MWP is simply an object lesson in the dangers of tampering with the climate. The Modern Warm Period will be far more severe. with plagues, famine, fires, pestilence. Due to shrinking species size and increased storm activity, raining frogs will become a more frequent occurence. The Team then adjourned to ride Lisbon’s No 18(?) tram, which if I’ve got the number right is one of Europe’s best and cheapest roller coasters. Does a nice loop around Lisbon, up and down it’s hills with ocasional stops for people to jump off and bounce parked cars out of it’s way. Lovely city, take hiking boots and visit the port museum to sample it’s port, ham anc cakes. Don’t plan on anything too strenuous after. “Climatologist” – (Late 20th, early 21st Century) An individual who uses climate as an argument in an effort to significantly reduce global population for the benefit of a select group of likeminded individuals in search of Utopia. Don’t know how anyone missed it. Look how widely publicized it was. WUWT right near the top, so those must all be first reads for everyone. 🙂 And Michael Mann was very quick to add it to his CV! Funny he didn’t write an op-ed about it. Anyway, all joking aside, I’d be careful about drawing conclusions one way or another about Briffa’s attendance. Right around when climategate broke, word was that he was ill.
Is the data event for your ‘NAP11-16’ a consequence of the MWP (in which case it is not precursor = forerunner) ? Hmm! It seems a pretty extensive list of participants. How come Craig Lowell wasn’t included on the list? More advocacy work by advocates masquerading as scientists. Paid for by the hard working taxpayers of the world. I am amazed at the arrogance and hubris of these people. Clearly these advocates are not stupid but apparently they can’t see the tsunami of anger headed their way over this obvious AGW fraud. These people are complete scoundrels. The real victim of their grubby machinations will be the integrity of science. The intellectual arrogance of the hockey team is mind-blowing! There is excellent global evidence for the MWP, which allowed the Vikings to colonise Greenland (which was not only well documented by Viking colonists and historians but also evidenced by the artifacts left behind them) and to attempt to establish colonies on the continental USA. The same MWP allowed the Polynesians to carry out their tremendous voyages of discovery and settlement in the Pacific, using double-hulled sailing canoes and navigating using star-charts. Reading English village records about the onset of the LIA is quite literally chilling and a pointer to how dangerous a markedly cooling climate is when crops fail, followed by livestock losses then the human population suffering massive losses through starvation and ill-health. As a result, there is little utility in picking over definitions of the geographic and temporal extent of putative epochs, especially in the Late Holocene. The pressing questions concern the dynamics of the climate system, and the relative roles of free and forced variations, whether the forcings are anthropogenic or not. This appears to be a statement that is saying that combing through yet more proxy records and yet more statistical techniques is pointless. The statistical hockey stick is being thrown under the bus. This is an announcement of complete capitulation of McIntyre. The “proxy” record is not adequate to do what these people wanted it to do. So, it appears the AGW adherents are listing against the established disciplines of History, Physics, and Statistics. How right you are! Here in the UK the genome of the Atlantic Salmon has been resolved from a specific river to a tributary and now to a particular burn (feeder) of that tributary. Armed with this knowledge fishery scientists are able to caution against restocking for fear of contamination of the gene pool of one tributary by the gene pool of an unrelated tributary in the same river system. The inertia that results is part of the plan. Fat arses need not move from their computer stations (Heaven forfend! ), and funds can be conserved for further cosy research rather than wasted on practical attempts to rectify a population collapse in the field. We educate too many children beyond their ability, forgetting that the degree we hand out so lightly enables their employment in positions of power beyond their capabilities and comprehension. The choice of hotel. It is no coincidence. This is not a secret meeting, but it is odd that it wasn’t reported, given the high profile of the issues under discussion. This is very much a political meeting, getting their story straight in readiness for the next IPCC report. “It took Europe as a whole around a 150 years for its population to recover to levels as seen at the end of the MWP. Even today there a regions in France that are less populated than they where at the end of the MWP. Irrelevant. Historians are not experts in climate science. So no matter how much proof exists that the earth was as warm, if not warmer, in the past couple of millennia, if climate science says it ain’t so, then it ain’t so. Don’t give them all the history, anthropology, biological records, zoological records, trade records, political history, geology, or any of the other vast areas of academia which have studied these periods in history, all providing ample accepted consensual evidence of a warmer past. They are not climate scientists and are only seeking to distract policy makers from the lack of real science coming from the real “flat-earth” climate deniers who consistently deny the reality of the RWP and MWP. Red-Green’s salad: a macedoine salad. Macedoine salad: something for everyone. Bring your own Medieval Warm Period (MWP) dressing. “Climate change”, “‘travel chaos'”, “serious threats”, “its effects”, “extreme weather events”, “global warming,”, “‘locked in'”, etc. The ultimate : “”widespread disruption”. Rail networks in the United Kingdom face serious threats from climate change and its effects, researchers say. Scientists from the University of Southampton say extreme weather events, projected to become more common over the next 50 years as a result of global warming, could lead to more landslides and floods. Damage from such events could cause “widespread disruption” to travel, the researchers say. “This is a really serious issue which needs to be addressed,” lead author Fleur Loveridge-Wanker, a Ph.D. student at the University of Southampton, said. Although not a major player (yet), Kim Cobb is firmly on the team, science-wise, but even more so emotion-wise. thank you for the notice concerning this conference and the link to the conference abstracts. I have just finished reading all of the abstracts. Other than three or so that have a political bent, the rest are the normal record of plodding scientific research endeavour. No News headlines, how refreshing…… just ongoing science at work. C’mon man, you’re pulling our leg. I guess it’s not surprising to see that grant money continues to flow. On the Yamal Peninsula in Siberia – hugging one tree? Why “especially” the late holocene? Does not a better understanding of “geographic and temporal extent” of these geological epochs help determine the extent of anthropogenic forcings? My own research, however remote from world of academia, shows that there is a well known and understood natural process that appears to be closely correlated to two major climatic science products: CETs and the PDO index. It is not a consequence, but it could and may be a cause, since it has all elements necessary to affect the climatie change. One or two WUWT contributors have expressed passing curiosity about nature of the data I present. All information could be made available to an institution that is willing to look into it in more detail, ascertain value of the data and the associated background information, and if appropriate initiate a further research. If you represent one, than you are welcome to contact me either personally or through WUWT. Dale, is this diagram on Jo Nova’s website what you were referring to? Scientific American has an interesting article on Dr Judith Curry’s apostasy. Was the medieval warm period global? Hall, B.L., Koffman, T. and Denton, G.H. 2010. Reduced ice extent on the western Antarctic Peninsula at 700-907 cal. yr B.P. Geology 38: 635-638. Margaret B. Williams et. al. P. W. Williams et. al. Edward R. Cook et. al. Taken from the conference brochure. But if we don’t agree with the monograph, what then? Little red button time I guess. The meeting refutes the off stated opinion that the warmers aren’t very smart. They’re smart enough to learn not to conduct long distance email graph modification plotting any more. Now has to be face to face. Not to worry, though, each should be able to schedule a few dozen trips/conferences/work sessions/etc. under all the funding they get. Who know, maybe the Virginia AG will flip one the the gang and start conducting live recordings. September enclave in Lisbon, Portugal. any papers, or didn’t even leave any calling cards. If they wanted to hold a meeting to find out about the Medieval warming period you would think they might have included some people who had found The MWP in their research work. That sounds like one of those quantum particles that can be in two different places at the same time! Am I to take that as literal or ironic, or both, or can I just take my pick? Whatever they may be skilled in, it is certainly not logic. Yes, it does lead to a better understanding, and it does so by placing the climate variations in upper & lower bounds to which natural forces are properly ascribed. With the natural forces constrained to upper & lower bounds, it becomes much clearer what part anthropogenic has and is playing. It looks like AGW is miniscule and of no particularly great import… at the level of the back of the geological envelope. Bravo to you for seeing the bigger picture. Phil jones memory must be playing him up again!! The -snip-. I know what they’re like and I still can’t believe their bare faced cheek. What with the IPCC now deciding in the wake of the IAC report, that the best way to deal with uncertainty is to suddenly become certain, it’s obvious these greedy, dishonest troughers are going to blag it out to the very end. I think this meeting gives an interesting insight into the mind-set of the CAGW set. We’ve lost the battle to hide the evidence of a MWP which had temperatures similar to today. The hockey stick graph has become a liability. Lets defocus the importance of this to our CAGW conjecture and concentrate on models which cannot be as easily falsified. The existence of a MWP at a time when CO2 levels were low, and the lack of any statistically significant warming for the last 15y, when CO2 levels were high and growing puts CAGW between a rock and a hard place. Expect more wriggling and squirming from the ‘team’ as they attempt to find a solution to please their political masters and keep the grant money coming in. I once went to one of them secret meetings, but alas, never again. Secret meetings always seem to be filled with extreme hurt in the nether parts of ones own sewer system it seems. So who really wants to meet in secret? David M Hoffer, well put, the problem with these magi is they do not as yet posess the power those who preceded them in history did, like Stalin and Hitler, they burbt the books that told the truth about their lies. The Viking history is hard to cover up, if they caim an even climate for 2000 years can we ask where the glaciers came from that engulfed their farmlands and only now are starting to recede (or maybe that has stalled too) were they among the scientists that made fun of the claims that the east coast of Canada is the Viking “vineland” because as any idiot can see there are no vines there?? I have qualifications in obselete computer hardware and general engineering but I plainly see their smoke and mirrors are failing to cover their sad lying asses, it is fraud on a grand scale given that it is against (in england at least) queen and country then treason is their crime, sadly the EU insist on no hanging these days, I will settle for dismissal, stripping of all qualifications and arresting all their assets, thats all. As there is no agreement on what the extent of, or even what the climate variations of these periods were – and as there is very little concrete knowledge on what the natural reasons for those or any climate changes are, I fail to see the logic of that claim. All that might be able to be said is at that time the climate might have been in a particular set of states – but not all states are known and some of the triggers for those changes and their levels are not known. Moreover, it is not clear what the motives of the re-assessment is; as the researchers in the gathering are known for hiding their data and their processing and even ‘hiding’ validation failures of their proxies. Perhaps if all their work was carried out ‘open book’ – as it should be if it is funded from taxation – then there would be more trust in what they were doing and any subsequent results. Otherwise it will be seen as an exercise in publicly funded obfuscation of the subject. Uhmmm, hiding behind some pine trees? regime changes across the hemisphere are clear. This does not directly contradict the findings of Mann. et. al. 2009, although the proxy count is low. The cited Mann study showed that some of the northern hemisphere was on a par with the 1961 – 1990 mean and a few areas were warmer, but not as warm as the instrumental record indicates for late 20th century when compared with the same baseline period. Silly me, but this seems to be in line with the findings of MBH 99, although Mann et. al. 2009 attempted to define the spatial extent of the MCA. Another, admitted, problem with this study was the fact that it could not be calibrated with the instrumental period because of the coarse resolution of the proxies used. In the end I cannot agree with the author of the head post, this is a normal conference which featured people presenting their latest results, others stating the needs for data to make forward progress and others proposing directions for future research. There is nothing weird here, lots more gets accomplished via a face to face communication — anyone who has participated in a teleconference will know this. As far as the charge that conferences are held in nice places… Well yeah. Most everyone is going to have to travel even if a conference is held in say, Glendive, MT in January. So why not hold it in a place where you can have a decent time with a lot of places to socialize outside of the conference. After all, the socializing and resulting cross fertilization of ideas is the real point of these things. God knows, in the days when I used to have employers who were willing the send me to conferences on Computer Science this seemed to me to be the main point. Yeah, it was fun, but mostly because of the people I was able to talk to rather than the place it was held (although that was a nice benefit, Disneyland, New Orleans, Chicago, New York, DC anyone?). Perhaps the bulk of future pal-reviewed papers will now use the term MCA to give the impression that the MWP was odd, unnatural, out-of-kilter and generally not a good fit with the rest of the two thousand years of climate because the term MWP itself is inappropriate. The troops are converging around the MWP, preparing an assault to embed in the 5th Assessment Report that will strengthen the premise that the late 20th C warming was indeed unprecedented by painting the past as a natural hiccup. This is clearly a gathering of like-minded people. I cannot imagine any proper scientist giving Jones the time of day after climategate. These people clearly have no sense of shame or proper science. It’s pronounced ‘Vaanker’ so it’s ok.
At time of writing, I count 4 of 137 comments calling this for what it is – boring, standard science conference stuff. The majority of the rest are pure groupthink reinforcement, baseless allegations of fraud, paranoia, mockery, rote repetition of smears and reposts of stolen emails. So this is the web’s no.1 science blog is it? You ought to be ashamed. You rained on the parade. So now you can’t go to the party. They just don’t learn. They’re going to rethink all their reconstructions and “homogenize” the data from various reconstructions, and yet, they still haven’t employed the skills of the worlds statisticians. Although, if they did use acceptable mathematics and proper statistical analysis, they would only prove themselves wrong and be looking for new jobs. So, in the end, I guess I can’t be too surprised. Just how stupid is Mann? In a couple of weeks the Republicans are going to take the House and they already said they are going to investigate Climategate. That means in a few months Mann will either have to answer questions or plead the 5th. Doing this now just hands the Republicans more ammunition. Maybe they were visiting the boquilobo bog or researching the ancient oaks of Parque National da Peneda-Geres. In most opinion polls, historically, Congress is lucky to get 20+% approval ratings, it’s usually in the teens. Don’t see that changing any regardless of who controls Congress. Ijhofe and Burton witch hunts to insue if they regain control of one/both houses of Congress? More meaningless biased non-peer reviewed reports from Congress a la The Wedgie Report? Hmmn. And those emails – freely released by an insider disgusted with the lies and coverups of many of this same conference, after they were deliberately gathered to one directory after an FOIA request by to be hidden by these same people – so a deliberate effort to hide data and invalidate the science from outsiders….. But you see nothing but a boring conference? Odd. May I ask how much you have profited by climate research money in the past 15 years? What articles you have published in which journals that you wish to protect for your own gains the past 15 years? See – them money and time and resources spent here by these previous and continuing conspirators is money, time, and effort deliberately spent now (conspicuously out of the exposure of the free press) to “create” the next IPCC report that they themselves will benefit from. And you see nothing wrong? If tree ring calculations say that it was too cold to grow stuff in Greenland, then the Vikings didn’t really grow stuff crops there? And more recently, we should be able to prove that the North West passage could not have been open at any time, and that Admunsen couldn’t really say that he sailed through it in a wooden hulled boat? And if a computer model calculates my shirt to be red, even though I have several witnesses that it is light green, it really is RED? Well, Gallup says you are wrong. If you ignore the outlier 84% (2001 attacks) you will see that the number is about 40% that Congress struggles to attain. You are clearly wrong here as well, it shows the absolute improvement in the Jan 1995 Gingrich/Contract era and the following ones. As the Congress shifted Dem, the Approval began to fall. Then Pelosi takes over in Jan 2007 with 37% and drove it down to 18%. That graph ends in May 2008 with approval at 18%, this one covers 2009 to July 2010, where 19% approval takes a mild jump during Barry Hussein Obama’s coronation and then continues the Pelosi death spiral back to 18% again. And some polls even place it into single digits. Also note that there are some 20% ratings in that history and it looks like it only happens when your Dems are in charge. Reference: Here are the Gallup pages I looked at (the 1st referenced graph is found at the first link, the other is found at the 4th link): 2008-05-14, 2008-07-16, 2010-07-22, 2010-09-20, 2010-10-15. I should point out that Gallup does as well as hiding the raw data as Mann does. I can’t find it anywhere. You are worried about Jim Inhofe and Dan Burton? LOL. You should actually be losing sleep over Darrell Issa (currently Ranking Member, House Committee on Oversight and Government Reform). This gent is a Pit Bull. Once that title Ranking Member gets switched to Chairman then you may begin worrying (and begin drinking, just don’t drive ;-). It is strange that you mentioned witch hunts don’t ya think? I mean we literally had Dems engage in one in Delaware. In case our foreign friends have not heard, the Democratic Socialist party has been busy asking the (R) Senate Candidate if she practiced witchcraft or was in a coven when she was in college! Yep. Right here, right now in the fall of 2010 they have resurrected a practice from 400 years ago! Ironic that this commenter, EFS_Junior, brings up witch hunts even though the Socialist party he is no doubt a member of, actually HAS been engaging in a real-life actual witch hunt. Ironic. Yes? Surprising. No. Of course he is trying to allude to McCarthy era hearings that were not witch hunts at all since Communist spies are not witches. There actually were and are Communist spies, which is what the entire point was in the first place..
By application of an entirely new branch of mathematics, for which a separate patent application has been filed, the simultaneous invention of matheMANNics, afforded a unique and previously unknown means of quantitatively integrating indeterminate quantities, ambiguous social constants, tunneling low energy IQ neurons, lost and deleted data, pretzel peer(review)ing, plausible and reversible deniability and single variable gaseous processing with the constants of misprision and fraud that when matheMANNicly factored results in a complete and natural replacement for rational thought. And who’s paying for all this? I assume that the exciting prospect of cross fertlilizing ideas is why Alarmists tend to invite so many sceptics to their jollies. The lemmings seem determined to hurl themselves over the cliff. Why do these warmist fools seem to have such a complete failure of concept regarding consequences to their actions? Do they think ‘Sorry!’ is going to be enough? They are in for a very rude shock sooner rather than later, imho. Well a very small number of people will always try and insist that the Emperor really ‘is’ wearing clothes, and it’s the unusually fine nature of the fibres in the garments, that when the light strikes them ‘just so’ imparts this tremendous glowing transparency to the whole ‘ensemble’. Usually it’s because it has suddently dawned on them that it isn’t just tomorrow’s lunch that’s on the line – it’s their necks on the line too . . . .
And even Mr McCarthy didn’t begin to comprehend the sheer scale of what was actually going on (the lid was peeled off with the KGB papers . . . ). Though he was definitely on the right track. That guy (Mr McCarthy) deserves a Very Public Apology. I noticed that Kieth Briffa wasn’t there. Wonder if he has let his club membership expire. He’s often struck me as a reluctant hockey player. 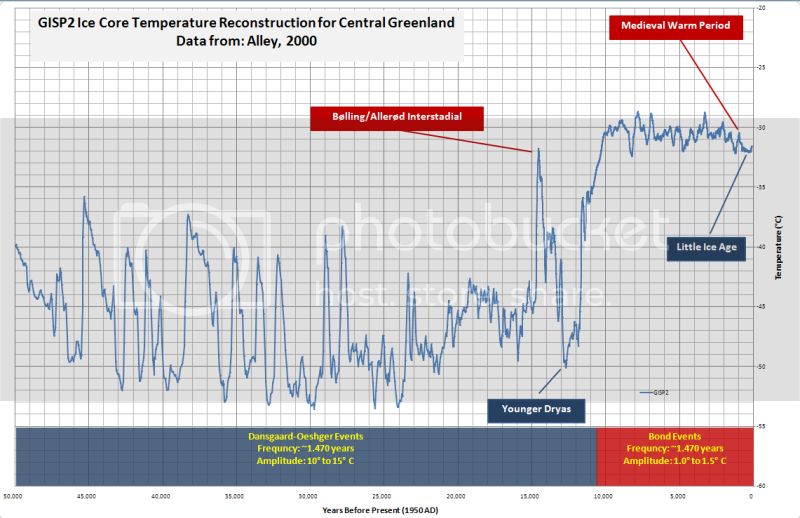 “Medieval Climate Anomaly” : Anomaly from Gk. anomalia, noun of quality from anomalos “uneven, irregular. Behind which lies the idea that there is “normal” … the climate as it is supposed to be, and “irregular, anomalous”, the abnormal climate when it isn’t what it is supposed to be. What makes this stand out from the rest of the “science” is that they very clearly know what they don’t know. That is the mark of a true scientist, they are cautious in their assertions and bold in their statements of lack of knowledge. Slight off topic but a great headline – “Michael Mann might get Mediaeval with Agincourt or get Criminal with Big Tuna”. Wallace Broecker wrote in 2001, in ‘Science’, that “[t]he case for a global Medieval Warm Period admittedly remains inconclusive”. Do any of you folk posting here have anything to add to this? Perhaps new evidence that the MWP was global? Well said, Mike Haseler, Oct 26 @1.19 am. The last sentence quoted there- “However, with a resolution of only 100 years, it is not possible to assess whether any decade in the past was as warm as any in the late 20th or early 21st centuries”- so mindful of our lack of knowledge about these earlier times- is particularly apt as reminder to those who like to assert that the MWP was warmer than any decade of the 20th century. Was as warm, if not warmer, than the Modern Warming Period. I think you have failed to make the case you think you have made. Can you say that the so-called “500 different peer-reviewed studies”, only a few of which I have looked at, show that “peaks” for the MWP are synchronous, that all the proxies used are equally valid, and for all regions, and that the magnitudes of anomalies reported for the MWP or LIA are consistent with other studies? Or, rather, is it that the MWP is “anomalously spatially variable” (Tingley, Huybers)? I do not think anyone doubts that there was with a large probability a warm period in the North Atlantic area in the period 950 – 1250 AD. However, there is no evidence (historical or archaeological) that it was warmer than the present. 40 English vineyards in the Doomsday Book is inconclusive evidence – there are wineries in England, Ireland and Wales today – and have been for many years. Even Scotland may be in on the act. The Norse Greenland colony, for which so much is claimed, did not do much beyond pastoral farming and hunting for bear & walrus. There were not expansive fields of wheat and barley as claimed – only small vegetable gardens. Try reading Jared Diamond’s “Collapse” for a good summary of what is known about the colony. And those graves at Hvalsey Church that Chris Monckton claimed are now embedded in permafrost – afraid not. Hvalsley Church is sinking into the clay. Plenty more evidence available, just ask and I’ll post it. Conspiracy theories are the last straw for people who don’t have any real arguments.